At The Studio we listen to your brief very carefully because a lot of time is spent in your bedroom and we want to get it right for you. You could want light, bright & breezy or warm and cosy; we can do it all. We offer modern & contemporary door fascia finishes as well as storage solutions for your clothes, shoes and accessories, ensuring everything is easy to reach. 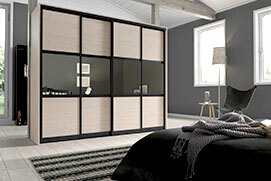 More recently we have noticed the high demand for sliding doors in bedrooms, and we can create many looks to suit any style. Our experienced team of designers will help you achieve your ideas and our highly skilled craftsmen will install your furniture to the highest standards, leaving you with your dream bedroom.